Have you ever covered how to clean your trampoline? What if you are like me and have not touched the trampoline all winter and now it is covered in sap and bird poo and other caked-on disgustingness? What should I do? I have actually never been asked how to clean a trampoline, making this a unicorn of a question! Well done, it’s actually a feat to find a topic I’ve not only not covered but that I’ve never even been asked about before — but if you have the question, someone else does too, so let’s do this thing. Cleaning a trampoline is a simple endeavour — soap and water is really all you need! — but there are some important safety considerations to take into account that make them different from how other backyard equipment can be cleaned. 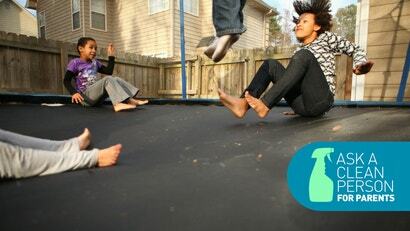 Before you introduce water and detergent to the trampoline, sweep the mat off using a broom or a dustpan and brush. You may be tempted to skip this considering that you’re just going to (spoiler alert!) turn a hose on the thing, but don’t: It will make the rest of the job easier if you take a minute or so to sweep away loose dirt, twigs, leaves and so on before the wet cleaning begins. This is also the time to do a preliminary check for damage, and clearing leaves and such away will better allow you to look to see if there are holes, tears or snags in the jumping mat. If the jump pad is damaged, it should be replaced. It’s also important to use the right tools and cleaning agents on the pad, to avoid causing damage during the cleaning process, which is actually very straightforward and definitely a job the kids can get involved in. Start by really soaking the mat; trying to scrub it while it’s dry can lead to tears, but the water will provide a lubrication of sorts that will allow you to scrub it without causing damage. Because the jumping pad can be easily torn or abraded in a way that will make it unsafe to use, it’s important to stick with either a soft nylon brush or rags when cleaning it. Stay away from steel wool or scrubbing sponges, or even heavy duty scrub brushes, unless they’re specifically soft-bristled ones. Make sure to scrub not only the mat, but the springs and pads too. It’s also important to stay away from cleaning agents that are any stronger than regular old dishwashing detergent; the chemicals used in other household cleaners can degrade the mat, making it unsafe to use. After scrubbing the mat well, there should be some satisfyingly gross brown suds that show you how much dirt and grime you cleaned off. Now it’s time to rinse the mat, and you’ll want to do that really, really well to ensure no soap residue is left behind. So: Hose the mat down until the runoff is entirely clear. Do an initial pass of wiping the mat and frame dry with towels, and then let the trampoline dry entirely before using it. A wet mat is unsafe for jumping. This is also the time to do a second pass to check for damage to the mat that may have been revealed during the cleaning process. This is definitely a job the kids can help with, but it’s important to note that the mat will become quite slick when covered in soapy water; make sure no one climbs or walks on it to avoid slips and injuries. The slickness issue is also why it’s so important to rinse the mat very well, and to not go hog wild with the use of soap — using too much soap will make the rinsing interminable. Once your trampoline is clean and thoroughly dry, get back on that baby and jump! And also maybe buy a trampoline cover to protect it from twigs and leaves and bird poop when it isn’t in use.